Yesterday I got told, do a homa in my meditation. That the meditations would go better. Oh btw I 4 days into the spiritual discipline. Readings and mediumship said, nothing fancy, just do it. Originally from the Vedicastrologer.org, Modified by Andrieh Vitimus, Joan Ross, and the Quantum Life Science Institute. Materials needed: Homa kundam, wooden/copper/ silver spoon/ladle, melted ghee and pieces of dried coconut (or wood or dried cowdung cakes). Sit facing east and place homa kundam in front of you. Place some dried coconut pieces or wood or dried cowdung cake pieces in homa kundam (fire pit). 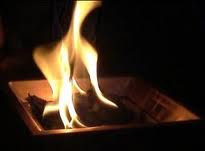 Light a camphor and place it in the homa kundam while saying "om bhuurbhuvassuvarom" and make sure that the pieces placed in homa kundam catch fire. 6. Pour ghee drops on fire while saying ALOT Mala Hreem Shreem Kleem Pah-rahm Esh-wah-ree Swah-hah, I didnt have the Mala to count but I was well over 500 on this. Simply put I can concentrate on the fire, And the counting. GIFTED Wrapped how to do this for you. This concludes the fire ceremony. I also got the technique down, to repeat it using a minimum amount of Ghee, and very little Coconut... Go me.. So I could do this again, wanna bet the "homa" is at least a once a week thing? This had a radically different vibe then the mantra work alone, as it usually does. While doing the mantric work usually I get drawn into the memories, this drew me into the fire. Often times, I would just stop be sitting there, and then restart the mantra... Total mind blanked. Body wise, lots of energy, although I am getting tired now... well see how I feel tomorrow.